and darling "Heather the Kitty" for your Jeremy and Julie Dolls! 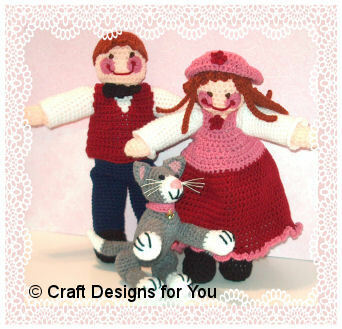 Pattern includes instructions for both boy and girl doll complete "Dress Up" outfits and Heather the Kitty. Also included with the pattern is the cord for Kitty's whiskers, chenille stem for Kitty's poseable tail, and Golden Heart Charm for Kitty's Collar. Jeremy & Julie Dolls sold separately. Crocheted with 4-ply yarns. Stitches used: single crochet, half double crochet and double crochet.